In cosmology, observations are made over the celestial sphere, giving rise to observations defined on the two-dimensional sphere, i.e. a spherical surface. If depth information is also available (i.e. redshift), then observations are defined on the three-dimensional ball, i.e. on a spherical volume. For example, observations of the cosmic microwave background (CMB) are made on the sphere, while observations of the galaxy distribution that traces the large-scale structure (LSS) are made on the ball. Often, however, observations cannot be made over the full sky. For example, we must look through our galaxy, which contaminates observations. Foreground contamination can sometimes be modelled and reduced, however regions of significant contamination must be removed altogether. In addition, telescopes often simply cannot see the entire sky. Dealing with partial-sky coverage can be difficult. Wavelets are a powerful method to do this due to their dual spatial and spectral localisation properties. Alternatively, one can build a basis concentrated in the observed region. This is a well-studied problem in signal processing and is known as the Slepian spatial-spectral concentration problem. Although this problem has been solved in the Euclidean setting, and also on the sphere, it has not been solved on the ball. 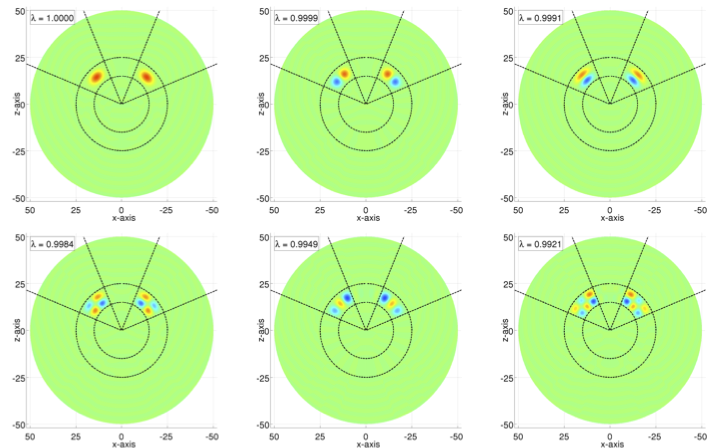 We recently submitted a paper solving the Slepian spatial-spectral concentration problem on the ball. The abstract of our submission is reproduced below and you can find the full paper on the arXiv. In additional to considering the standard Fourier-Bessel basis on the ball, we also consider the Fourier-Laguerre basis, which exhibits a number of practical advantages. 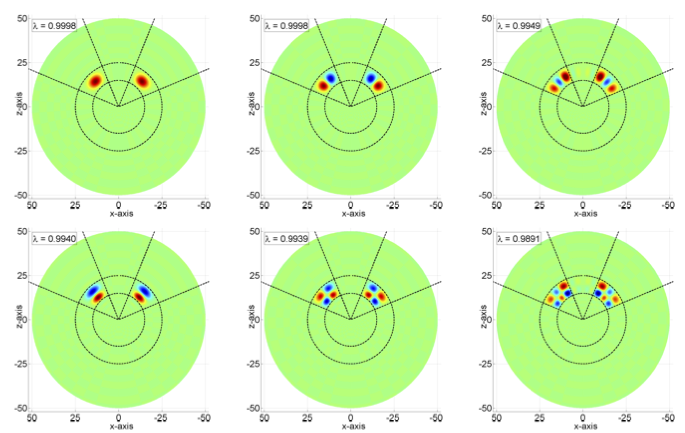 The first few Slepian functions concentrated within an example region are shown in the following plots for each basis on the ball.